Today Almost all web and mobile apps allow you to log in with Google and Facebook. 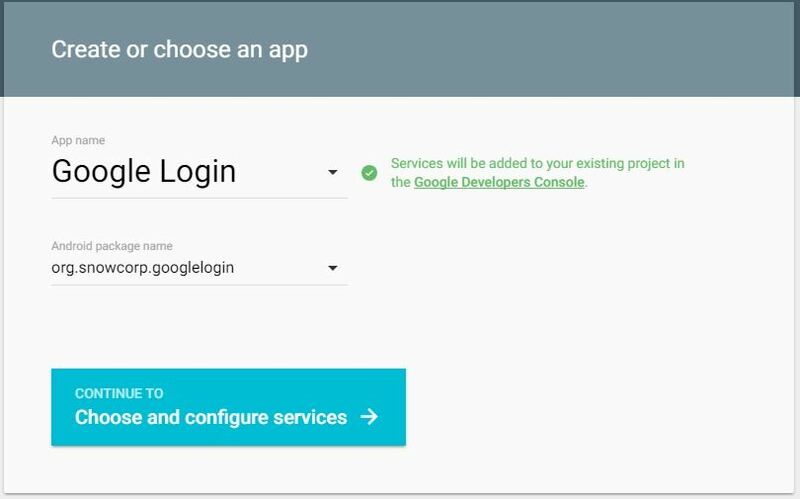 In this tutorial, we will describe how to integrate Google Sign-in to your Android Application, We will be creating a sample Google Login app describing how to integrate google login and retrieve user profile. The user can login using her existing google account. Go to this link and Click Get a Configuration File button to get a configuration file to add to your project. or you can open a direct link here. The configuration file provides service-specific information for your app. To get it, you must select an existing project for your app or create a new one. You’ll also need to provide a package name for your app. When you generate the configuration file, you will also need to provide the SHA-1 hash of your signing certificate. See Authenticating Your Client for information. Now Click on Generate configuration files button and download the google-services.json file. Copy the google-services.json file you just downloaded into the app/ directory of your Android Studio project. If you want to change your SHA1 key for debugging app or release app then Open the Credentials page in the API Console and edit your app’s OAuth client Id. Now that you have configured a Google API Console project and set up your Android Studio project. 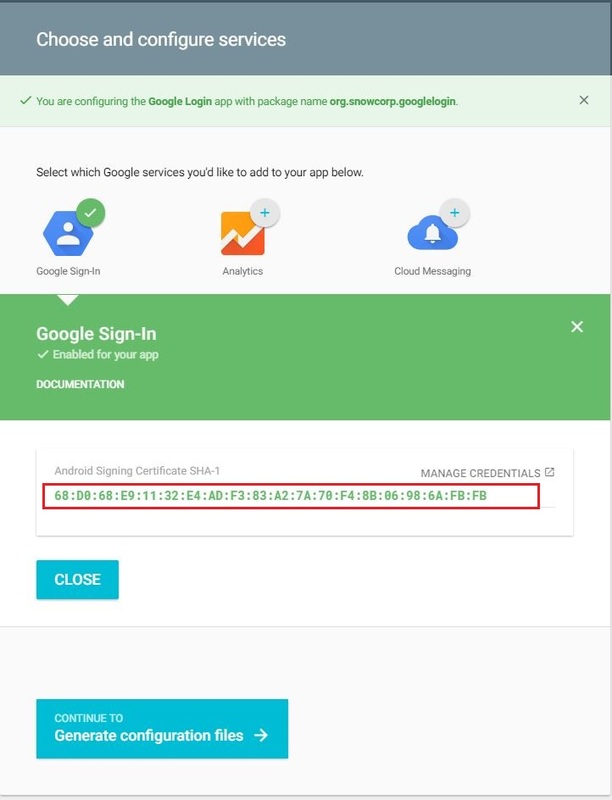 To integrate Google Sign-In into your Android app, configure Google Sign-In and add a button to your app’s layout that starts the sign-in flow. 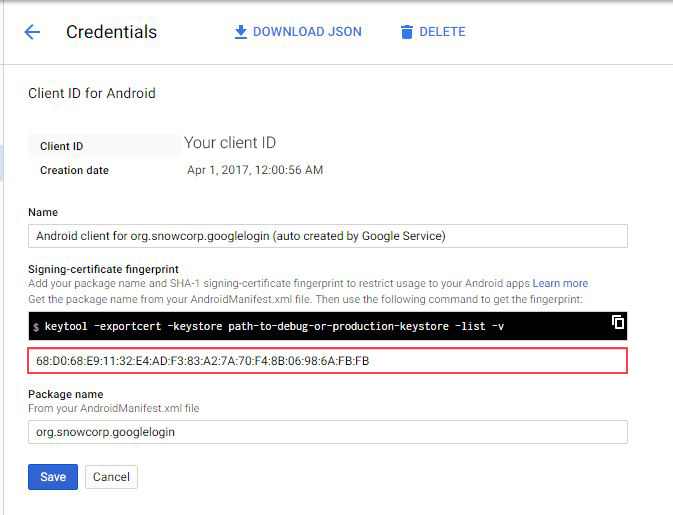 In your sign-in activity’s onCreate method, configure Google Sign-In to request the user data required by your app. For example, to configure Google Sign-In to request users’ ID and basic profile information, create a GoogleSignInOptions object with the DEFAULT_SIGN_IN parameter. To request users’ email addresses as well, create the GoogleSignInOptions object with the requestEmail option. If you need to request additional scopes to access Google APIs, specify them with requestScopes. Then, also in your sign-in activity’s onCreate method, create a GoogleApiClient object with access to the Google Sign-In API and the options you specified. Optional: If you are using the default sign-in button graphic instead of providing your own sign-in button assets, you can customize the button’s size with the setSize method. In the activity’s onClick method, handle sign-in button taps by creating a sign-in intent with the getSignInIntent method, and starting the intent with startActivityForResult. In the activity’s onActivityResult method, retrieve the sign-in result with getSignInResultFromIntent. After you retrieve the sign-in result, you can check if sign-in succeeded with the isSuccess method. If sign-in succeeded, you can call the getSignInAccount method to get a GoogleSignInAccount object that contains information about the signed-in user, such as the user’s name. You can also get the user’s email address with getEmail, the user’s Google ID (for client-side use) with getId, and an ID token for the user with with getIdToken.